There are a number of potential causes of cracked and bowing foundation walls. 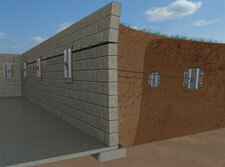 The most common reason is pressure from the soil near the outside of the wall. When soil gets wet, it expands and puts pressure on the wall. The wall can crack or break when the force exceeds the strength of the wall. This reduces the structural integrity of the wall, and when the saturation cycle is repeated, this further causes weakening and inward movement. Foundation Supportworks uses a Wall Anchor System that permanently stabilizes commercial foundation walls and offers the best opportunity to straighten foundation walls over time without the cost and disruption of foundation replacement. Strong, galvanized earth anchors are embedded securely in competent soil out away from the foundation wall. The anchors are connected to heavy-duty, steel wall plates with long, threaded, galvanized steel rods. The anchors will hold the wall in its current position, without any further adjustment. A unique and important benefit is the ability to tighten the wall anchors when the soil shrinks. This enables possible improvement and straightening of the bowing foundation wall. 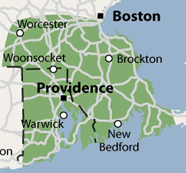 Contact us today for a free commercial foundation estimate in Providence and areas nearby.